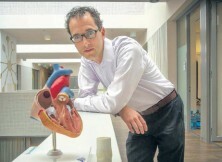 Insights on the Xeltis research, its history and the unprecedented potential of bioabsorbable heart valves from Martijn Cox, Xeltis CTO, who was interviewed in Brabants Dagblad. Martijn explained how the Xeltis heart products combine world-leading science in chemistry of materials, biomechanics and microstructure to support the body’s natural healing process before they get bioabsorbed. He also stated that Xeltis’s ambition is introducing the next standard of care in cardiovascular surgery.